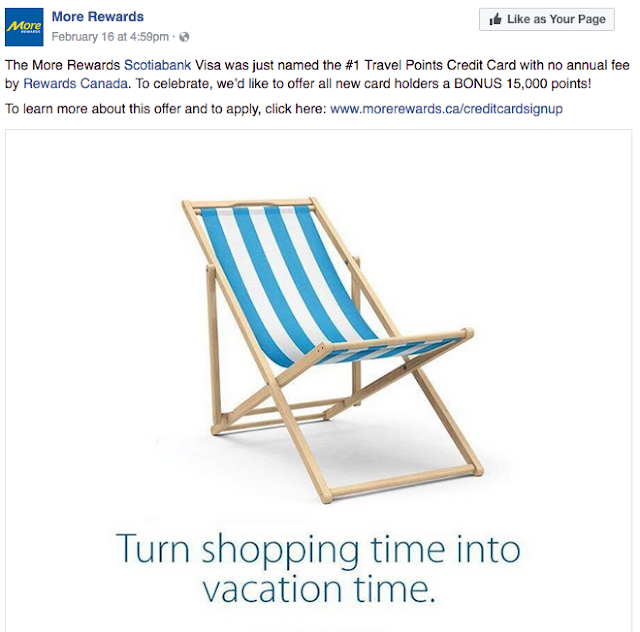 Rewards Canada: Canada's Top Travel Points Credit Card with no annual fee now has a 15,000 point sign up bonus! Canada's Top Travel Points Credit Card with no annual fee now has a 15,000 point sign up bonus! In our 2017 Top Travel Rewards Credit Card rankings we crowned a new winner in the Travel Points Credit Card with no annual fee category, the Scotiabank More Rewards Visa card. It took first place without a sign up bonus, that's how good the card is and it just got better. If you apply for the card by March 31st you can get up to 15,000 bonus More Rewards Points. You'll get 5,000 upon approval and 10,000 more on your first purchase. A pretty easy way to score those 15,000 points worth around $63 towards travel. Doesn't seem like much but when you add it in to the 6 Points per dollar you earn at More Rewards partners and 4 points per dollar everywhere else it is a nice addition to the card. 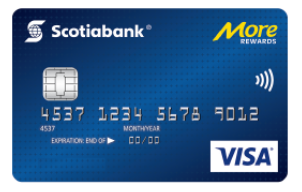 You'll want to read our full review of the Scotiabank More Rewards Visa Card here but we'll mention again that the 4 points and 6 points per dollar that you earn are the equivalent of a 1.65% and 2.54% return towards travel redemptions. That's huge for a no annual fee card! And not to toot our own horn but it appears that this sign up bonus is a celebration of us awarded the card first place in this category! Earn 6 More Rewards points for every $1 spent on purchases at participating More Rewards locations including Save-On-foods, PriceSmart Foods, Overwaitea Foods, Cooper’s Foods and Urban Fare stores and participating More Rewards partners such as Petro Canada and Panago. No annual fee and no earning or redemption caps.